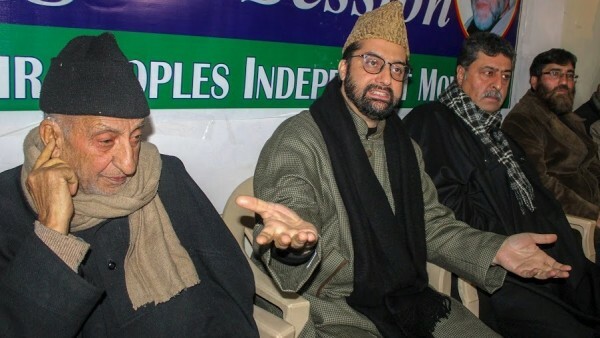 Chairman of the moderate faction of Hurriyat Conference Mirwaiz Umar Farooq says his telephone conversation with Pakistan Foreign Minister Shah Mehmood Qureshi was their first contact from the Imran Khan administration at the "political and leadership level" and they told him that Kashmir issue cannot be solved unless India and Pakistan come close to each other. In an interview, Mirwaiz Farooq also said that Hurriyat wants an end to violence in Kashmir and dialgoue was the only way forward. He said Modi government’s objections to his phone conversation with Qureshi on Tuesday may have a link to the impending Lok Sabha elections. The unusual phone call by Qureshi on Tuesday elicited a strong reaction from the Indian government which termed it “a regressive step and is contrary to the overall perception, which the Pakistan leadership is trying to create”. Farooq said that Hurriyat representatives have been in touch with the Imran Khan administration. “We have a set-up in Muzafarabad and Islamabad. Our party representatives are there. They have been meeting them and calling them. But it is first time they have officially reached out to us at the leadership level. It was the first at political level,” he said. Farooq said Qureshi told him that Pakistan Prime Minister Imran Khan “tried his level-best to reach out to India” but there was no response. “He (Qureshi) said Pakistan is very disappointed that Imran Khan made a lot of efforts to reach out to the Government of India, we took initiatives, we did Kartarpur, offered a dialogue on Kashmir but there was no response and a negative response”. The Hurriyat Conference leader said Qureshi also told him that they were concerned about the situation in Kashmir and wanted a peaceful solution to the problem. Qureshi, he said, told them that they will try to reach out again to India after the Lok Sabha elections. “We also told him that interest of Hurriyat is also that the two countries come close. Till then the our problem will also not be solved,” he said. “There is no other option. We have to engage with each other and find a solution. That is exactly what Vajpayee understood when he said that we will resolve it in the ambit of humanity,” he said. Farooq said that Vajpayee government not only talked to Pakistan but permitted a Hurriyat delegation to go the neighbouring country and they had met Pakistan leaders in Delhi earlier. He said educated people were taking up guns and four youths in the Valley who were students had gone missing on Thursday and had probably gone to militant camps. He said Modi government’s approach to Kashmir has been one from the military standpoint. “We said we wanted to be a bridge of friendship between the people of two countries as we know that the solution will not be found till the two countries come close. “If Hurriyat Conference also wants to play a role in this, why is it an irritant? They should welcome if we can play a role in ending violence and bringing the two countries together. He said Kashmir issue should not be linked to “vote bank politics” in the Lok Sabha elections. “Now there are elections. To get votes, they will perhaps go to any extent. It will be unfortunate if Kashmir is linked to vote politics rather than looking at it form humanitarian and political angle,” Farooq said. Farooq said that Pakistan could come under attack during election speeches but people should understand the background and context of the Kashmir problem. He said Pakistan has been saying that Kashmiris should be involved in the process of moving forward.